If you indulged yourself, as so many people do, over the holiday season, chances are that you are in the market for adjustable dumbbells. These handy workout tools allow you to control the exact amount of weight you incorporate into your strength training. They allow you to start out light and work your way into a more intense workout and they allow you to incorporate small amounts of weight into your cardio and endurance training, while also providing you with the heavier weights needed to improve your overall strength. Bowflex, Powerblock and Gold’s Gym Bayou Fitness, and Universal are the most popular dumbbell manufacturers and which one you choose will depend largely on your personal workout needs and budget. Any of these would work great if you’re doing P90x. *Due to current sales, price ranges may vary. 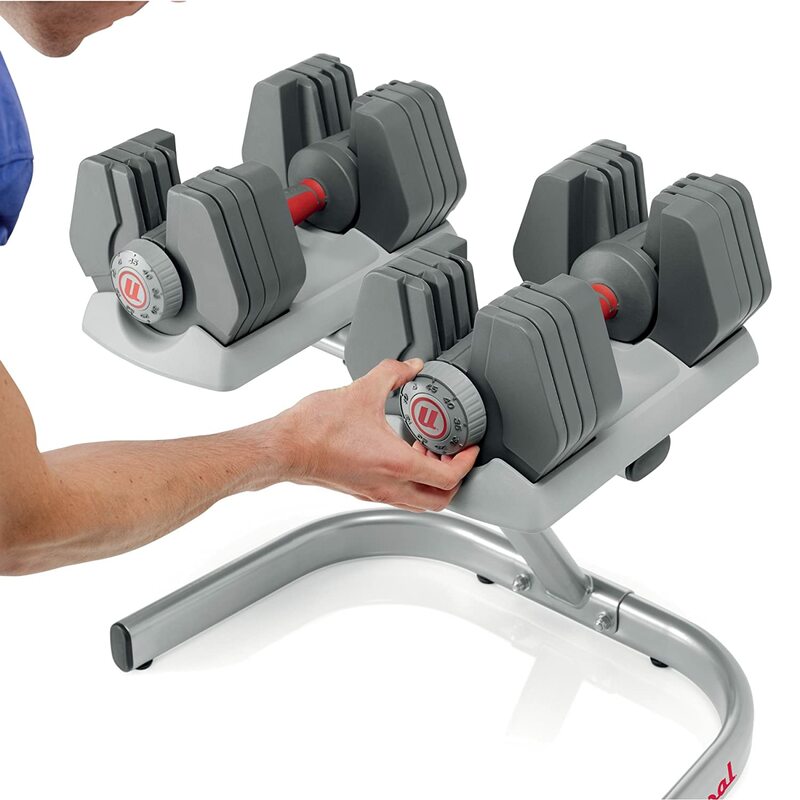 Bowflex’s most popular model of adjustable dumbbell is the SelectTech 552. This versatile set is weighted from 5 to 52.5 pounds and adjusts in increments of 2.5 pounds for the first 25 pounds. This means that this single set of dumbbells takes the place of 15 regular sets of weights or 30 individual dumbbells. Because it adjust in such small and specific increments, the SelectTech 552 can be used in over thirty different exercises, including squats and lunges for your legs, rows and lifts for your back, presses and flies for your chest, crunches for your abs, curls and extensions for your arms and presses and raises for your shoulders. It comes with an extensive set of warranties: 2 years on all parts, 5 years on weight plates and 1 year on labor. While this is one of the more expensive models on the market at around $550, its high quality and versatility make it worth the added cost. The Powerblock Elite is Powerblock’s top selling set of adjustable dumbbells. Its unique block design comes with a padded handle to help protect your wrist and a selector pin that allows for quick weight changes during your workout. The Powerblock Elite adjusts from 5 to 50 pounds and can be expanded to 70 or 90 or even 130 pounds if you get the extension. It goes in 2.5 pound increments, meaning that it takes the place of 18 sets of weights or 36 individual dumbbells. It offers more than enough choices for most weight lifters. What the Powerblock lacks in range, it makes up for in price. At around three hundred for the set, Powerblock offers great value for your money. It also comes with a limited 10 year warranty. The Bayou Fitness Adjustable Dumbbell is the most basic looking of the reviewed dumbbells. Instead of some nifty or weird looking design, it just looks like metal dumbbells. Of course, since these are adjustable, they’ll look different than regular ones. These are adjustable from 10-50 pounds with increments of 10 pounds. This makes it the dumbbell with the least range of weights of the ones reviewed on this page. However, there is a way you can go up by 5 lbs each and that is to put an uneven number of plates on each side. For some exercises, this is fine since you can just move your hands up the grip a bit for better balance but for other exercises, it’s not. It comes with a total of eight 5 lb plates, the bar itself is 10 pounds. 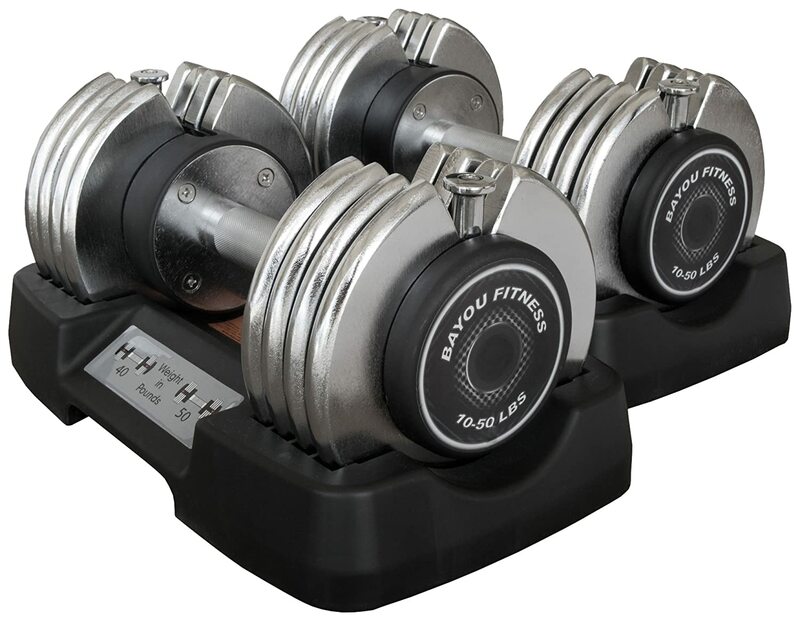 These Universal adjustable dumbbells has a weight range from 4 to 45 lbs and goes up by increments of 5lbs with first jump being 6 pounds. Unlike the Bowflex where you have to adjust both ends of each dumbbell, with the Power-Pak, you only have to adjust one side to change the weights. These can work great with the P90x program. Since it comes with a stand, you don’t have to bend over to pick the weights up. Even if you don’t use the stand, say for space purposes, they still sit on a tray so it’s not just sitting on the ground. One common complaint is the plates can shift around making noises. Although the plates aren’t going to fall off, this can be annoying for some people as they prefer something more solid. The design looks nice and it’s made of decent material. Weights can tend to shift while you use them. The Gold’s Gym Adjustable Dumbbell is one of the newer products to hit the market. It features hand grips for added comfort, a stand that conveniently holds unused weights in the proper order and an easy knob selection that allows you to adjust between 10 and 50 pounds of weight. 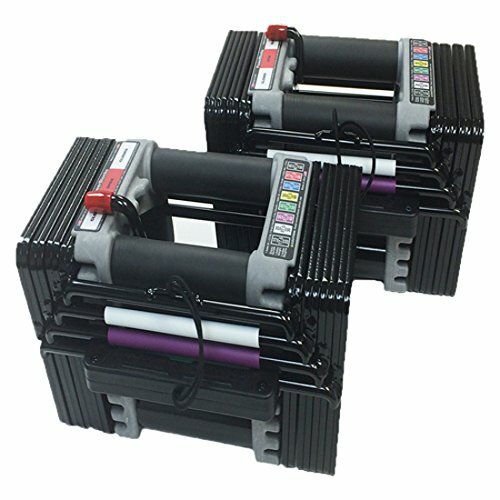 With a list price of nearly five bills, it is in the same price range as Bowflex. Unfortunately, however, many users have noted flaws in the design and manufacturing. Plastic pieces are liable to break and the adjustment pin frequently sticks. If all of these are a bit too much for you whether in terms of price or weight, then check out these dumbbells. They go up to 40 pounds adjustable by 2.5 and 5 pounds. These aren’t necessarily “adjustable dumbbells” but you can add on and take off weight. It’s not as convenient mind you, but for the price, you can save a lot of money compared to the other brands. In the end, you should choose the adjustable dumbbells that are best suited to your workout style. If you want the most versatility and range of adjustable weights, you should go for the Bowflex SelectTech 552 which is sold as a pair. If you do not need the full range of weights and would like to save a few dollars, you cannot go wrong with the Powerblock Classic. Now if you want one that can go up to 90lbs, then get the Powerblock Elite 90. Bowflex also has a higher weight model as well but it’s pretty expensive. Now if you just want something inexpensive and don’t care about going for a brand name, then check out these Bayou Fitness adjustable dumbbells for under two bills. It only comes with one but if you don’t do bench press and shoulder presses, you probably only need one.